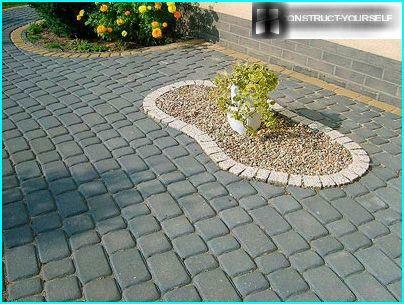 Paving - practical finishingmaterial that opens up many creative possibilities. 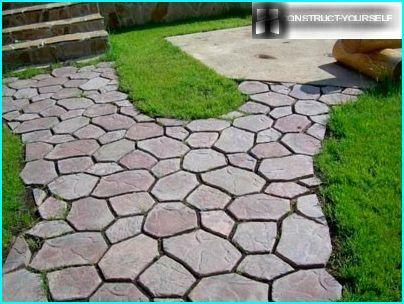 There are many types of paving slabs of different shapes and textures. 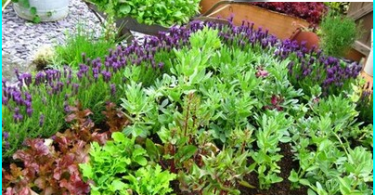 This material is available in a wide range of colors, but usually only two colors to create an attractive pattern on the ground near the house or on the garden path. Options for laying paving slabs are different, what to prefer - it depends on the place and its purpose. 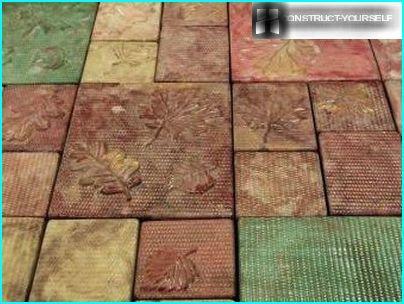 Before laying the tiles any way you need goodto prepare the base - remove the top layer of soil. If you are going to lay the tiles on the soil, grassy, ​​but sand and gravel needed for leveling the surface. After that, the base is filled with sand layer (5-10 cm). 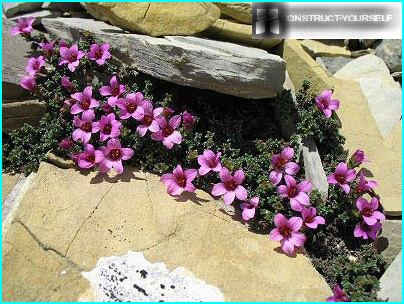 The substrate can be compacted, and you can just pour water from a hose with a nozzle, allowing moisture to be absorbed. In the first, the most simple case, the tiles can belaid on the wet sand. This is a good method for laying garden paths, they will have virtually no standing water, it will be absorbed in the seams and leave the sand, and then ground. However, this option can not be called a thorough styling. The second way - not labor, and more practical. To create a mixture of cement and sand mix (ratio 1/5), the mixture is distributed evenly over the site after the tile's surface need to pour the water. Water will provide a good grasp of the mixture, penetrating between the seams. Laying tiles on the cement-sand mortarIt is the safest option, but also the most difficult. Manually prepare a solution is difficult, so here it is desirable to have a concrete mixer. The ratio of cement and sand and 1/5 prepared solution spread on the base, use a trowel for leveling. Layer solution - 3-4 cm for laying tiles using a rubber mallet.. If stacking is carried out without bias, be sure to use gutters for water runoff. The above-described methods for laying paving slabshelp in choosing the right option, but it's only half the story. Lay the tile quality is very important that the resulting coating is durable and practical, but the design of laying paving slabs attached considerable importance. The use of tiles of different colors, withinteresting textured surface, putting some in a specific pattern can create cover really interesting and aesthetically appealing, pleasing the eye and animates the face of the yard and garden. Driving laying paving slabs can be very simple, when in a certain order combines two colors, and complex, with which you can create these drawings. 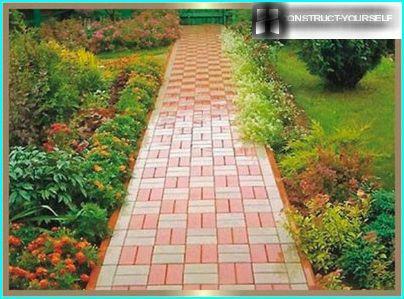 For the paving of the yard or garden, you can trackchoose a classic rectangular tiles. Despite the fact that its shape is simple rectangles of different colors can be successfully combined to form an interesting pattern. 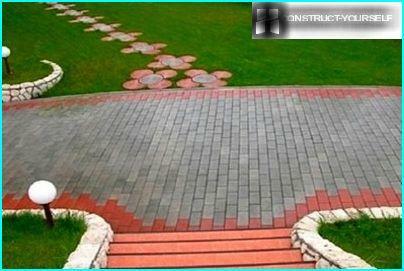 When choosing a tile shaped track will look more original. 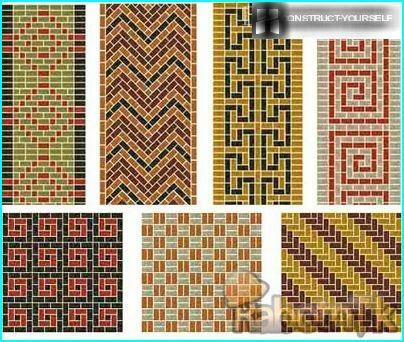 Popular schemes of laying paving slabsIt refers herringbone braid. Herringbone pattern can turn vykladyvanii tiles at a certain angle - 90 ° or 45 °. Braids - version of Christmas trees, when alternating tiles reminiscent of weaving. Braids created by alternating longitudinal and transverse installation. A simple method of laying, which will be goodlook at the track - chaos or random mixture. To create a chaotic pattern, it is possible to use tiles of different color and size, putting it in a random order. It's easy, and the result can turn out interesting. Two-tone tile square shaped, laid out in a checkerboard pattern, always looks spectacular. 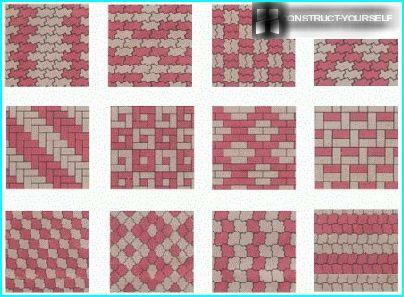 It can be used to create two rectangular tile cell. 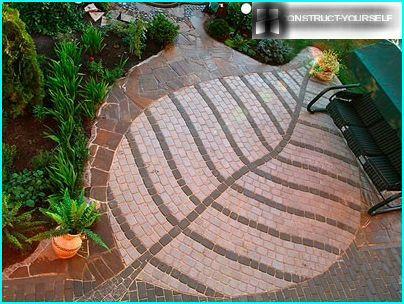 Examples include paving laying circularPattern has a special place. 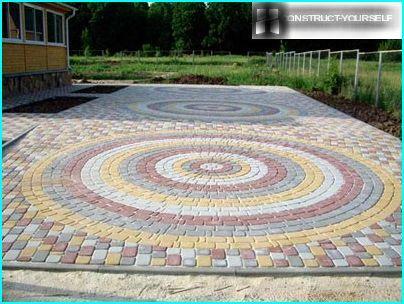 Pattern "circular pattern" will create a beautiful area in front of the house, a place of rest in the garden. If on the creation of a pattern of tiles running a creative person, you can deviate from the usual schemes, creating wonderful drawings, which look very impressive in the normal position or height. An interesting combination of forms tiles and lawn,when a part of the lawn framed tiles or in the center of the track or area to create a small flower bed. 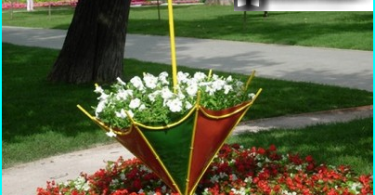 This element of landscape design, using which you make your site more aesthetically appealing. Species paving laying therequite a lot of the material is inexpensive and it is not much need for the small garden, and in combination with other agents decorative finishes it will help you make your courtyard and garden more comfortable and more beautiful.